Remember the early days of online video? Video players rebuffering without any end in sight? While this seems as though it took place long, long ago, online video advancements have actually accelerated at a rapid clip. Now, online video streaming is (or should be) a delightful experience, rising to meet our every expectation. For disabled users, though, online video can be overly frustrating. Online accessibility measures are improving but not yet perfect. Many video players--but not all--are compatible with the screen readers of blind users. Unfortunately, video captions and transcripts are often not a priority for video program owners (VPOs). Not only is this removing a potential audience segment, but some VPOs could be in violation of federal communication law. The 21st Century Communications and Video Accessibility Act (CVAA) requires video captions for the inclusion of deaf and hard-of-hearing audiences. But CVAA compliance can be confusing as it's not a blanketed law that includes all online video and new deadlines pass every six months. Let's sort it out together and better understand your relationship with the CVAA and accessibility options via Brightcove Video Cloud. The CVAA was signed into law by President Obama on October 8, 2010. This act was an incredible victory for disability advocates as it was considered the most significant accessibility legislation since the Americans with Disabilities Act (1990). The CVAA was passed to ensure that Americans with disabilities have access to 21st century technologies, and new devices are reviewed for inclusion regularly. The gadgets and devices we use daily were unimaginable when federal communications laws of the 80's and 90's were first drafted; the CVAA fills this gap. Do CVAA Captioning Rules Apply to Me? It is important for Internet video providers and distributors to know the CVAA requires video programming that is closed captioned on TV to be closed captioned when distributed via Internet protocol (IP). Pay close attention to CVAA requirements if you are the content distributor, or both owner and distributor of online video content. Captioning rules apply to television stations, cable systems, broadcast and cable networks, as well as all streaming online video services. The Federal Communications Commission (FCC) places the burden of responsibility primarily on the program owner/copyright holder. Program distributers are responsible for allowing captions to "pass through" to the end user, without compromising quality, whereas a channel owner/copyright holder--such as ABC On Demand--would be responsible for the creation of these captions. Don't worry! 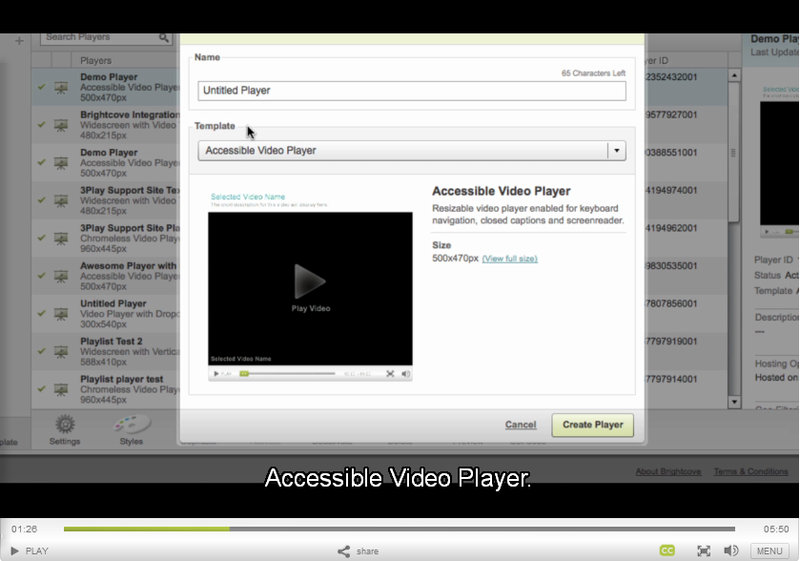 Accessibility choices are available through Brightcove Video Cloud. The Accessible Video Cloud player allows you to add captions while the 3Play Media integration allows for the easy request and post-back of video captions. Online video captioning quality should be on par with that of broadcast TV captions. Captions quality is evaluated on completeness, placement, accuracy and timing. Captioning standards for IP video require end-user controls with the ability to change text color, opacity, size, font, background color and other attributes. The SMPTE-TT (Society of Motion Picture and Television Engineers Timed Text) caption format is regarded as a "safe harbor interchange and delivery format" by the FCC. Which Online Videos Require Captions? 100 percent of pre-recorded video programing, edited or non-edited, previously aired on TV with captions must have captions when shown online. Live and near-live programs, such as awards shows or sports programming, shown on TV with captions, must be captioned when broadcast online. Currently, video clips, consumer-generated media, and Internet-only movies do not require video captions. A simpler way to think about it? If it aired on TV with captions, it must stream online with captions. It is worth noting that in June 2013 the FCC released a notice of proposed rulemaking in which the organization delayed a decision on whether to require captions for video clips. To learn more about this decision as well as captioning deadlines for archival content, read: CVAA and FCC Online Video Captioning Requirements and Deadlines. Tired eyes boring into a computer screen, 30 seconds away from pure video-watching joy or pure mental breakdown—this was often the experience of viewers during the early days of online video. So, in the same way that video technology has advanced, captioning technology is only getting better and better. What was once a very manual process is now as simple as: upload, relax and play. This means video captions aren't really optional for any online video platform, they're a necessity. Because we live so much of our lives online, expect communications and accessibility legislation to become encompassing of more entities in the future. Want to learn more? Download a six-page brief on the 21st Century Video Accessibility Act.